Clerkships - Neurology and Emergency Medicine. Intersessions - The Intersession Course is designed to provide the opportunity for all third and fourth-year students to return to campus to engage in content that is best addressed while students are actively involved in patient care. The Intersessions also allow students to come together as a class for collaborative and reflective time as they are progressing in their journey of becoming physician. 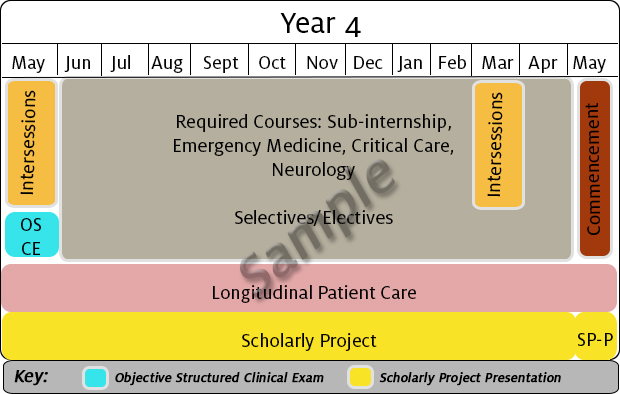 Longitudinal Patient Care – The Longitudinal Patient Care program spans years 3 and 4 of the medical curriculum. Students select three to five patients during their first two clerkships in year 3, whom they follow longitudinally over the course of the next two years with students from other health-related fields. Scholarly Project Year 1-4 – During the Scholarly Project course, which spans the entire four years of study, students learn about medical information literacy, life-long learning, teamwork, effective communication, research methods, evidence-based medicine approaches and ethics related to scholarly inquiry. Each of these topics will be explored in depth as the student completes an individual hypothesis-driven research project over the course of this four-year experience. Selectives and Electives – A wide variety of electives are provided through Phoenix-area and out-of-state hospitals, medical centers and private practices.